I try to make it back to Ontario at least once a year to enjoy the fishing, in fact I’m there right now. I know that must sound strange coming from a guy who lives in the heart of rainbow trout country, but I just can’t help getting excited by the fish I was raised on. 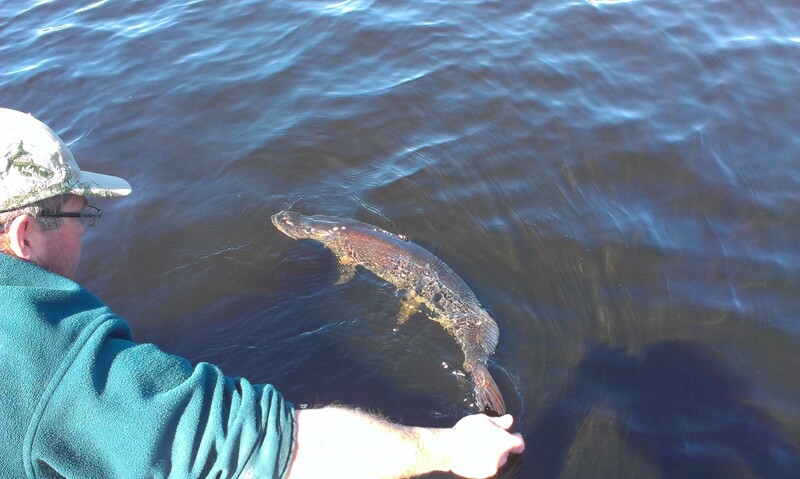 Personally, there is nothing quite like tackling a large northern pike, especially, as I discovered earlier this year, on a fly rod. Everything from the way they smash a fly to watching a three foot fish throw itself out of the water makes the experience exciting, at least for me. The closest thing it’s comparable here in the West, I think, is the bull trout. I have had similar experiences with both this year. As for walleye, they might not be full of fight, but they’re a great table fish and, if you find a body of water where they aren’t being constantly harassed, they’ll put up a surprisingly decent struggle. There aren’t many opportunities in our part of the province to get into pike and walleye, but for those who find themselves down around the Columbia River, here’s a few pointers. Pike are not the pickiest fish on the world. Chances are, if you drag something by them, they’re going to hit it. In my experience, pike have a few standard spots you’re going to find them, hanging out under logs and deadheads or by beaver dams. They also like moving water, so feeder creeks or streams that connect lakes are also a good place to look. They’re not shy, they’ll hit within a few feet of the boat, even when you’re running a gas powered motor. A northern Ontario pike caught on a six weight. A net is also handy when dealing with pike. As I mentioned, they like to run when they’re right beside the boat, so the faster you get them in a net, the better. You’re also going to want to get a set of pliers or something for removing your hook. They have mouths full of some pretty pointy teeth and, I can tell you from experience, that removing the hook without a set of pliers or a hook remover is an extremely unpleasant experience—so much so that I never leave home without one now, regardless of what I’m fishing for. A wire leader, or even just some high test line, also helps. Pike are notorious for biting through line and anything that makes it harder for them to get through the line goes a long way. I’ve used regular gear leaders, 12 pound test and wire tippet all with success. Pike will hit almost anything, especially the little guys, but I’ve found there’s a few things that are almost guaranteed to bring out the big boys to play. 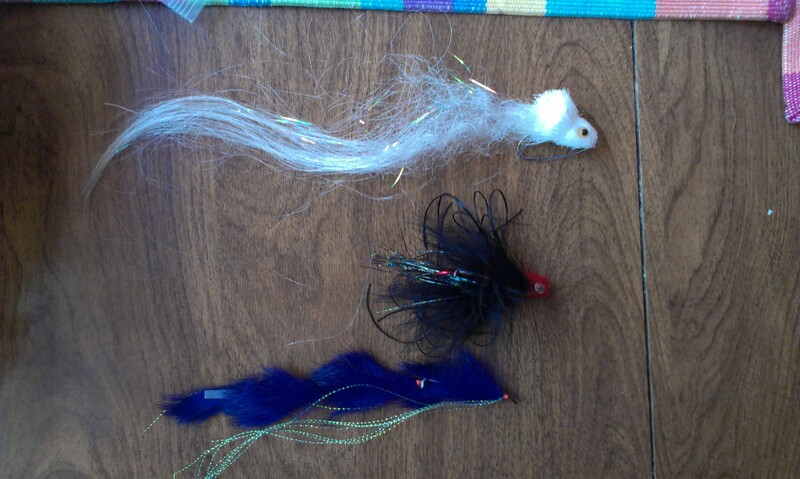 The first one is big leach patterns. I’ve had huge pike hit a bunny leach that was pushing four inches long and was purchased with big Alberta bull trout in mind. Big woolly buggers or even not-so-big woolly buggers will also land you a hit. At dusk and dawn, you can get some pretty great top water action going with mice or other big floating flies. 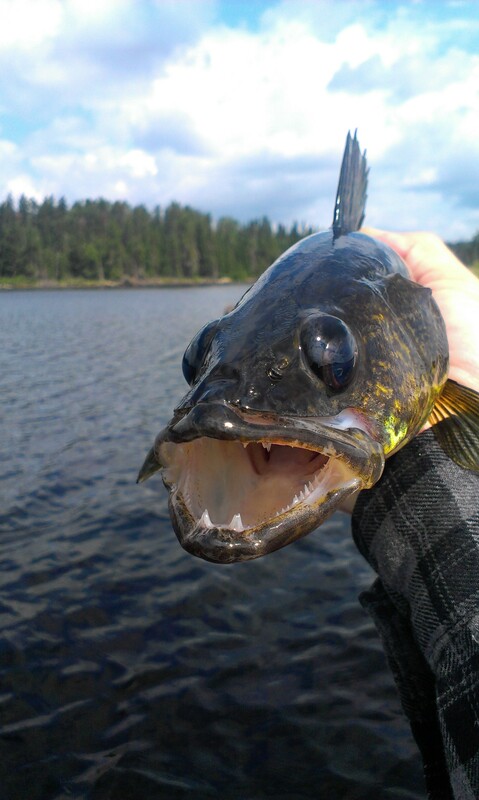 Hands down, the hardest thing about catching walleye is finding them. Depending on where you are, the best time of day to catch them is earlier in the morning or around dusk, but if you’re on a lake that is somewhat murky, or you go deep enough, you can catch them all day. Sometimes it’s a matter of finding exactly the right spot, like a 20×20 square in the water, that’s productive. I’ve been on lakes where anything outside of that square is dead, but inside that square is walleye central. Look for rocky points, shoals or bays. Typically, at least in my experience, they’re in water anywhere from 3 to 20 feet, depending on the time of day and time of year. They also have a preference for moving water, so rivers or river mouths are also good places to look. I’ve had great success in the past using woolly buggers. It never seems to matter what colour you use, but I’m partial to chartreuse and find it effective. 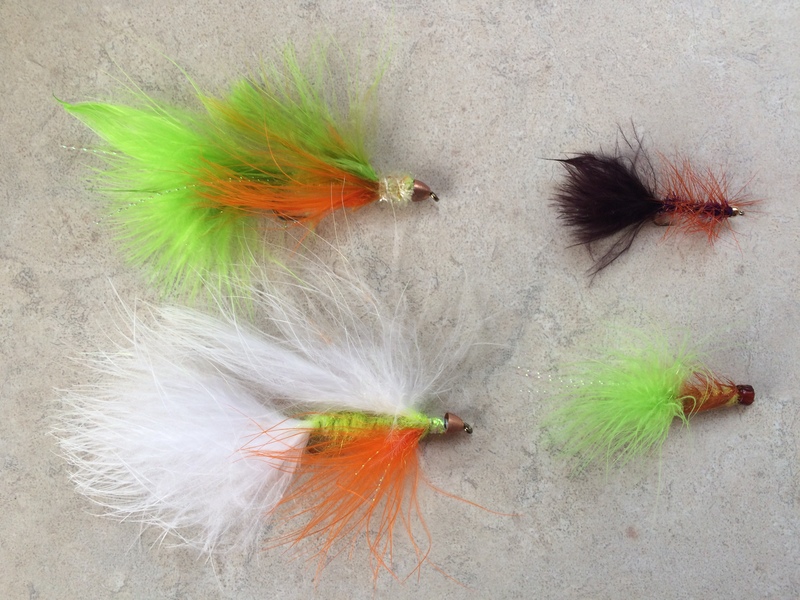 This last year, I had also had a lot of success on the above mentioned Scotty’s McFly, again chartreuse was my go-to colour, but I found white with orange to be a very effective colour pattern as well. Leach patterns also work, anything that imitates a fish should also be effective. As I mentioned, the hardest thing about walleye is finding them. After that, it’s almost too easy.